A new recipe from Great Bowls of Fire for us tonight — this one was nice and spicy! 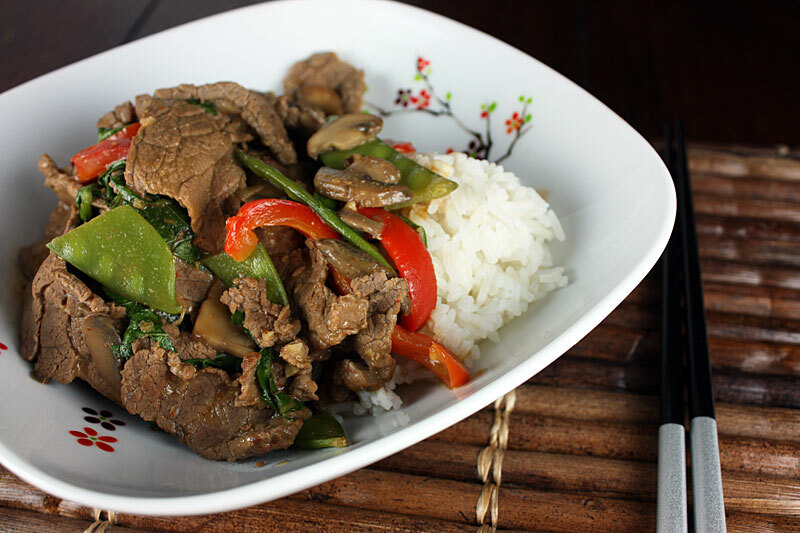 Thin strips of beef are stir-fried with peppers, mushrooms, and snap peas, and drowned in a sauce of coconut milk, chicken broth, and soy sauce. Filling and delicious! Whoa — this is spicier than I was expecting! Don’t be a baby… it’s a lot less intense with the rice. Hey, I’m the one who likes spicy, remember? I just meant I had my chili sauce at the ready and don’t think I’ll need to add as much as usual. While you’ve been jibber-jabbing about spicy foods, I’ve been enjoying my dinner.. mmm, so good! I love the coconut milk flavor. Agreed. If this dinner was a song by Kansas, it’d be “Curry on Wayward Son”. So, I’ve learned to live with your puns, but what the heck does that even mean? No clue. Okay, I’m going to finish eating this deliciousness. In a large wok, heat the oil over medium-high heat. Add the beef and stir-fry until browned, 4-6 minutes. Remove from the pan and set aside, keeping warm. In the same wok, add the bell pepper and mushrooms and stir-fry over medium heat for 5 minutes. Add the ginger and garlic and stir-fry for 2 minutes. Add the beef and curry paste and stir-fry for 2 minutes more. Stir in the coconut milk, broth, snow peas, soy sauce, cumin, and coriander and bring to a gentle simmer over medium heat. Cook, stirring, for about 5 minutes. Meanwhile, in a small mixing bowl, combine the cornstarch with 1 tbsp water. Whisk into the curry sauce and cook, stirring, for 1 minute. Stir in the basil leaves and serve over rice.